These stylish raincoats made of a lightweight micro fiber blend are reversible, and easily pack into their own pouch. 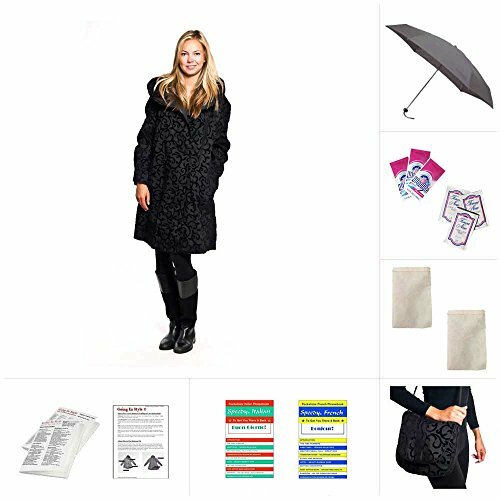 This Donatella fashion raincoat features and an over sized pleated hood and does not wrinkle. Scroll style is dry clean only. Check inside pocket for washing instructions. Petite Coat Size 4-6 Coat Length 37" Sleeves 33.5"
Small/Medium Coat Size 8-10 Coat Length 38" Sleeves 34.5"
Medium/Large Coat Size 12-14 Coat Length 39" Sleeves 35.5"
Note: All MycraPac coats are generously cut. If you have any questions about this product by Mycra Pac, contact us by completing and submitting the form below. If you are looking for a specif part number, please include it with your message.